Please be certain that the location field is correctly filled out when you register. All registrations that appear to be bogus will be rejected. Which means that if your location field does NOT match the actual location of your registration IP address, then your registration will be rejected. Sorry about the strictness of this requirement, but it is necessary to block spammers and scammers at the door as much as possible. Health Issues/Feeding Problems Anything related to general or specific health problems. Issues having to do with feeding problems or tips. So I have an old corn snake, fifteen or sixteen years old. He's always been super food focused, his first reaction to any movement in his enclosure was to try and eat it, but otherwise is a super good natured snake, I don't think I've ever seen him aggressive. Recently he's been having increasing trouble with food. At first he seemed a lot more tentative and unsure about his food. Then, he'd regurgitate the mouse if anything disturbed him before he'd completely swallowed it, so I'd have to turn off the lights and leave the room for him to eat. Now, for the last four or five weeks he's not eating at all, at the last two time I've tried he reacts aggressively/fearfully to the mouse. I've left mice in overnight, and tried smaller sizes. I'm also unsure if he's drinking, I haven't seen him do so in a while. His mouth seems pink and healthy. He's starting to get skinny, so I'm getting worried. Any advice would be very much appreciated. I was hoping someone else would reply. I hate to sound pessimistic but the scenario you describe isn't very good. You need a vet checkup right away, but steel yourself for bad news. At his age he has lived a long and rewarding life, and hopefully the vet can find a reason for the obvious decline. Good luck. Thanks for the reply, but unfortunately the snake (Wayne) died shortly after this was posted, before I could take him to the vet. Sorry to hear Wayne passed, but thank you for providing him with care. I hope you decide to obtain another corn snake. Join now to reply to this thread or open new ones for your questions & comments! 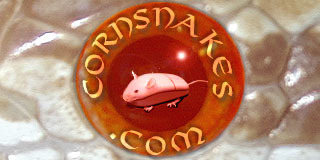 Cornsnakes.com is the largest online community dedicated to cornsnakes . Registration is open to everyone and FREE. Click Here to Register!